"The inhabitants of this place are very sociable, & friendly, perhaps more so now, than they will be several years from hence, for this being a new college every one is exerting himself to give it name and reputation. And the students therefore, are treated with the greatest courtesy, & are warmly received into the families of Auburn. The citizens take a great pride in introducing a young man, & endeavor to make him feel at home – as though he were thrown among those in whom he could confide, & with whom he could spend his leisure moments pleasantly…I think after becoming familiar with the place, that it is indeed an excellent place for a college." The new Methodist institution and the surrounding community apparently made quite an impression on Lee in its inaugural semester. Academia, however, was not entirely a new concept for the Auburn community as the plans for construction of the school emerged early in the 1850s. The first public announcement of the community’s intent came in 1853 with a call by local residents for support at the Methodist annual conference scheduled for Autaugaville. The desire to create an institution of higher learning in Auburn appeared to have great support, but the Methodist church provided nothing in the way of resources. Later, Auburn citizens approached the Methodist church with a plan to establish a college for young men in east Alabama, but the bid went to Greensboro, which created a $200,000 endowment and won the support of the church. The announcement that Greensboro won the bid to receive the support of the Methodist church came in December, 1854. The Auburn forces, under the leadership of Reverend O.R. Blue, acquiesced in realization that the continued rivalry would stall any effort to establish a college in their town. 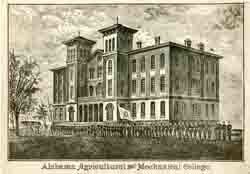 The Auburn coalition, nevertheless, maintained their effort to establish a college. Positive results materialized in February, 1856, when the Alabama legislature overturned the governor’s veto in favor of incorporating the East Alabama Male College in Auburn. Even so, three more years passed before the Alabama Methodists openly supported the institution. In 1856 the board of trustees for the East Alabama Male College accepted control of Slaton’s Male Academy, which, became the preparatory division of the new school. The preparatory school opened in January, 1857, with an enrollment of one hundred students. When the college opened in 1859, the preparatory school’s enrollment had already increased to one hundred and thirteen students. On October 1, 1859, the East Alabama Male College formally opened in tandem with the already established preparatory division. Some years later, college President James Ferguson Dowdell described the combination as “departments distinct and complete in themselves, related to each other as parts of one whole…a school combining in itself the common school and academy of the country and the college, under the name of college.” The Reverend William Jeremiah Sasnett, D.D., of LaGrange, Georgia, was chosen as the first president and professor of moral science. Born in Hancock County, Georgia, in 1820, Sasnett had been educated at Oglethorpe University, served as the first pastor of the Methodist church at Prattville, Alabama, taught English at Emory College, and served as president of LaGrange Female College in LaGrange, Georgia, before coming to Auburn. Other faculty included John Darby, A.M., professor of natural science; John W. Glenn, A.M., professor of mathematics; John T. Dunklin, A.M., professor of ancient languages; W.P. Harrison, A.M., adjunct professor of ancient languages; and William F. Slaton, A.M., professor of applied mathematics and principal of the preparatory academy. While the preparatory school remained in operation during the Civil War, the college suspended operation to become a hospital. James Ferguson Dowdell assumed the presidency after the war while professors Darby, Dunklin, and Glenn returned as faculty. Dowdell had achieved fame during the Civil War as organizer and colonel of the Thirty-Seventh Alabama Infantry Regiment. During the initial stages of secession, he voted to leave the union while representing Chambers County at the Alabama secession convention. Dowdell served as president of the college until he resigned in 1870; afterwards, the college administration consisted of a faculty government with no president. Among the faculty during this transitional period was Alexander D. McVoy, A.M., professor of moral science; John T. Dunklin, A.M., professor of Latin and Greek languages; Alexander Hogg, A.M., professor of mathematics; and William G. Stubbs, A.M., professor of chemistry and applied mathematics. 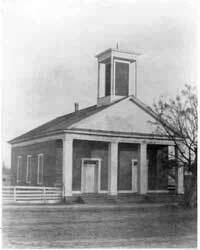 Auburn Presbyterian Church was built in 1850-51 on the corner of what is now College Street and Thach Avenue. At various times during the 19th century it served as a Confederate hospital, classrooms and even a temporary worship place for Episcopalians. In 1976 it became the University Chapel. What type of education was offered at the college? What was required of its students? The college courses offered in 1859 were representative of the liberal arts curriculum of the day, heavily laden with Greek and Latin. They stressed discipline and piety. To matriculate, a student must have completed course work at the preparatory level after which he was obliged to sit for examinations in requisite subjects. By the 1869-70 term, the college had been divided into junior and senior departments with courses offered through eight schools. The preparatory school sought to “give thorough training in the common English branches and to fit the pupil either for the college course or for the ordinary business pursuits of life.” Preparatory classes included reading, writing, geography, arithmetic, English grammar, composition, common school history, and introductory Latin. The tuition for a forty-week session at both the preparatory school and the college was $30.00 to $40.00 with an incidental fee of $2.50. A student who successfully completed course work at the preparatory school was allowed to enter the junior department of the college where he subscribed to “a system of thorough training and drilling” that was enforced “in the classes, so as to render the student master of the elementary principles of the subjects engaging his attention.” The projected time to complete the course at this level, according to the college catalog, was three years, with courses including Latin, Greek, mathematics, English, and natural science (including geography). In moving to the senior department, the student became eligible to choose an area of concentration from the eight schools available. Among the disciplines were liberal philosophy, Greek language and literature, Latin language and literature, mathematics, natural science, modern languages, civil engineering, and commercial arithmetic and bookkeeping. The student, upon choosing his field of concentration, was projected to complete any three schools in two years. Examinations in each discipline came at the midterm and at the close of the session. Degree or certificate examinations, which were given during the first week of June, were both oral and written. The college catalog (1869-70) specified that a written certificate of good standing from the student’s last teacher and from the last institution attended must accompany applications for admission. Degrees for courses of study offered three options: the Bachelor of Philosophy (B.P. ); Bachelor of Arts (A.B. ); and Master of Arts (M.A.). Discipline at the school was firm but fair. 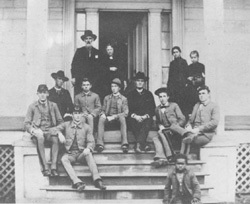 According to the college catalog, “the discipline will be kind, but at the same time strict and decided, always looking to the proper training of the pupil, mentally, morally, and to the prosperity and character of the college.” Each student was required to attend the weekly faculty meeting to answer for any infraction of school regulations. The faculty judged students’ guilt or innocence and either meted out the proper demerits or excused them and returned them to classes. Students were also required to attended morning and evening prayers and to attend Sunday worship at any of the local churches. 19th century educator in Georgia and Alabama. him in the 37th Alabama. Despite its high ideals, the East Alabama Male College suffered from a chronic lack of revenue. The chain of events that eventually led to a partial solution to this problem began in 1857, two years before the East Alabama Male College formally opened. In that year, Justin S. Morrill, a congressman from Vermont, introduced a bill known as the “land-grant” act. Although initially rejected by the Buchanan administration, President Abraham Lincoln signed the bill into law on July 2, 1862. The bill provided that for each U.S. senator and representative a state would receive 30,000 acres of public land or land scrip for the purpose of establishing a college offering courses in agriculture, engineering, and military training. The original act of 1862 excluded Confederate states, but subsequent acts in 1864 and 1866 removed that restriction and also extended the application deadline. According to the provisions of the Morrill Act, Alabama was entitled to 240,000 acres of land. In February, 1867, the state legislature authorized Governor Robert M. Patton to initiate the application process on behalf of the people of Alabama. The constitutional convention was also in session at that time and many of the delegates expressed support for a land-grant college in Alabama. One such delegate was Daniel H. Bingham from Limestone County who suggested an amendment to the constitutional section on education, which called for the state to accept the Morrill Act. He also noted that the proposed college might be added as a section of the University of Alabama. The issue of the proposed college’s location stirred lively debate at the convention, and although Bingham’s amendment was adopted, it was not included in the final draft of the constitution. Although the proposed college remained a topic of debate in various political circles, no real steps were made to take advantage of the Morrill Act until 1869, when Republican Governor William Hugh Smith called upon C.D. Hudson to act as agent for the state and to file the necessary documents with the U.S. Secretary of Interior. Those documents were then forwarded to the commissioner of the general land office, and certificates representing 240,000 acres of agricultural college scrip were forwarded to Alabama. The question of the school’s location remained unanswered and would prove to be a difficult problem to solve. In 1869 the state Board of Education requested that the U.S. Congress place the grant of 240,000 acres of land at its disposal, arguing that the Morrill Act stipulated that no federal money could be spent in the construction of buildings. The board noted that the University of Alabama, which it supervised, already had a campus. The board also requested that the Alabama legislature make the proposed land-grant college a branch of the state university. Educational concerns, however, were quickly pushed aside after the election of Democratic Governor Robert B. Lindsay in 1870. The following year the legislature authorized Lindsay and a special board of commissioners to dispose of the scrip, which they sold for ninety cents an acre. The board of commissioners then directed the state auditor to invest the money in eight percent bonds of the state of Alabama. Meanwhile, the deadline for participating in the Morrill Act was quickly nearing expiration. Republicans insisted that the five-year period outlined in the law applied to Alabama’s initial act of acceptance in 1867. Democrats, however, argued that it applied to the subsequent act of acceptance in the U.S. Congress in 1868 and therefore the state had an extra year to move on the issue. The debate quickly devolved into an unproductive partisan squabble costing the state valuable time. When Governor Lindsay finally realized the urgency of the situation he admonished the legislature to move on the issue. In November and December, 1871, several cities from across the state competed for the location of the land-grant college. Representative N.N. Clements of Tuscaloosa introduced a bill to establish the school as a part of the University of Alabama. Next, Lee County’s Representative Sheldon Toomer entered a bill to locate the school in Auburn. Then Representative B. F. Taylor of Lauderdale County introduced a bill on behalf of Florence. In the Senate, J.L. Pennington of Lee County introduced a bill to locate the school at Auburn and J.M. Martin responded with a bill supporting Tuscaloosa. A motion to locate the school in the Tennessee Valley came when J.J. Hinds of Morgan County nominated Florence. On December 5 and 6, the legislature formed special committees to select a location for the land-grant college. With the various nominations and the prospects for even more, it seemed logical to form a joint committee from both houses to select a site. Members of the Senate, however proved reluctant to cooperate with the lower house, and the idea was rejected. Nevertheless, on December 8, Senator Pennington introduced a joint resolution to consolidate existing legislative committees into one special committee. For unstated reasons, however, Senator Martin objected and was able to have Pennington’s motion tabled, ending the Senate’s cooperative effort. Selecting a faculty for the proposed land-grant college also generated conflict. The state Board of Education assumed leadership in this matter and in December, 1871, almost appointed a faculty. After much criticism, however, the board decided that their action was premature and delayed the appointments. The issue of race became a factor when Peyton Finley of Montgomery County, the only black member of the Board of Education, proposed that the legislature set aside part of the federal funds for an agricultural college for blacks. Finley’s proposal passed, but the legislature ignored it. Nevertheless, the Board of Education had gone on record as favoring one land-grant college for blacks and one for whites. Cities competing for the land-grant college waged vigorous campaigns in state newspapers. The competition rekindled the long-standing rivalry between north and south Alabama. Of all the competing locations, Tuscaloosa made the most convincing argument for making the land-grant college a branch of the University of Alabama. With powerful advocates throughout the state and in the legislature as well, Tuscaloosa appeared to have best chance of being chosen. At one point, the University of Alabama even assembled its cadets in Montgomery to impress the legislature, which drew condemnation from scores of legislators who charged that the university had engaged in unfair lobbying tactics. Florence also seemed to have a fighting chance of being selected as the home for the new land-grant college. It was already home to the Florence Wesleyan College and in 1871 its board of trustees offered the school to the state for the land-grant college. A group of Florence supporters, including former Governor Patton, traveled to Montgomery to plead their case, claiming that the school property was worth $50,000. Auburn’s bid for the land-grant college was arguably the most desperate. The town was home to the East Alabama Male College, which had closed from 1862 to 1866. Since reopening it had fallen upon dire financial straights. By 1871 the faculty had informed the board of trustees that lack of funds prevented the school from continuing operations. The board of trustees decided to offer the school to the state for the land-grant college. In December, 1871, the Methodist Conference met in Mobile and granted a delegation from the college permission to offer the school’s grounds and buildings to the state, which was accompanied by a donation of one hundred acres of land from the citizens of Auburn. By early February, 1872, the selection committee announced that it was ready to recommend Florence as the location for the new land-grant college. Other business and stalling tactics from supporters of competing cities delayed debate on the committee’s recommendation until February 13. When the issue finally came before the House, the majority report was not presented. Instead William Murrah and four other committee members submitted the minority report, which favored Auburn. Murrah and the others argued that Auburn offered a larger and more valuable building than that offered by Florence, and, moreover, that the Methodists at Auburn had properly relinquished all proprietary claim to their college. The committee went into special deliberations to consider striking Florence and inserting Auburn as the recommended site. Deliberations lasted for days and several drafts of the final bill were read and voted on. Finally, on Saturday, February 24, 1872, the bill placing the land-grant college at Auburn was read a third time and passed. Although selection of the site had been confirmed, debate and controversy continued for months. When the school finally opened as the Agricultural and Mechanical College of Alabama with Isaac Taylor Tichenor as president, mere survival quickly became the paramount issue. For further information see William Warren Rogers, "The Founding of Alabama’s Land Grant College at Auburn," Alabama Review 40 (January 1987): 14-37.